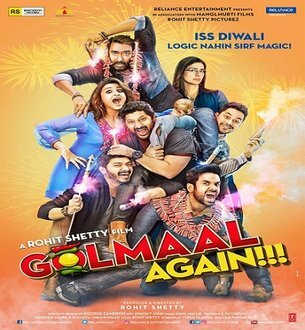 Below are Box Office Collection Report of bollywood film 'Golmaal Again' With his review, budget and total box office and worldwide collection status. Golmaal Again movie lead star cast is Ajay Devgn, Parineeti Chopra. Golmaal is an indian Comedy, Drama Film of 2017, directed by Rohit Shetty & produced by Ajay Devgn, Rohit Shetty. Golmaal Again film Released in over 3500+ screens in India and 732 screens in overseas, Total 4232+ screens worldwide. Golmaal Again is 2nd biggest opening of the year. Film 1st day earned 34.14 Crore and Weekend the numbers would go up to Rs 85 crores easily. What I really like about this Diwali is that Bollywood is offering us two films to entertain and both the films cater to different audiences. Storyline:- The gang of five - Gopal, Madhav, Lucky, Laxman and Laxman, again! (Kunal) are orphans who have been raised in Seth Jamnadas' orphanage in Ooty. When they return to their orphanage to mourn the death of their mentor, they hear that an avaricious builder, Vasu Reddy (Prakash Raj) and his associate, Nikhil (Neil) have designs on the ashram and the adjoining plot owned by Colonel Chouhan.